Born in Warneton on 8 June 1798 into a family of Belgian artists, Eugène Joseph Verboeckhoven received his early training in his father Barthélémy’s sculpture studio. Together with his younger brother, Charles Louis, he learned drawing and clay modeling as a boy, with an emphasis on the study of anatomy. In 1816, when the artist was eighteen years old, the Verboeckhoven family moved to Ghent where he continued his studies under the direction of the sculptor Albert Voituron at the Academy of Fine Arts. After 1818, Verboeckhoven pursued further painting studies with the landscape painter Balthazar-Paul Ommeganck. It was while he worked with Ommeganck that he came to understand the classical landscape tradition of Nicolas Poussin and Claude Lorraine that would ultimately become the foundation for his own painting. 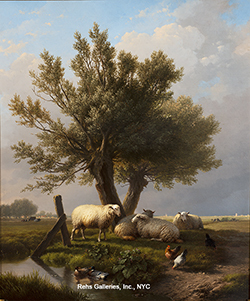 Ommeganck also introduced the fledgling artist to the work of seventeenth century Dutch and Flemish animaliers such as Paulus Potter and Albert Cuyp whose rural scenes featured domesticated animals in a bucolic landscape. For Verboeckhoven, the combination of anatomically precise cattle, sheep or goats and a pastoral landscape offered an ideal mixture of elements on which to base his career. He made his debut at the annual Salon in Ghent in 1820, where his work was received with glowing praise. From that point forward, Verboeckhoven’s career would be one triumph after another. Few artists have enjoyed such a consistently successful reception, but Verboeckhoven seems to have understood who his audience was, and what type of painting they would enjoy. In 1824, he exhibited at the Salon in Paris, again receiving positive reviews, and thus expanding his market internationally. Verboeckhoven also traveled extensively throughout the 1820s. In addition to his journey to Paris, he visited Holland, England and Germany where he absorbed the techniques and imagery of a wide variety of landscape painting traditions. In 1827, toward the end of this decade of travel, he moved to Brussels and immediately became embroiled in the struggle for Belgian independence from the Netherlands. He fought in the victorious war of independence, and subsequently, was appointed the director of the museums in Brussels in 1831. In this capacity, he established the foundation for Belgian fine arts museums in the newly autonomous region. During the 1830s, the artist also established his own atelier and began to accept students. Like so many Dutch and Flemish artists before him, Verboeckhoven also set up a system of collaboration among his fellow artists. Most of them were Belgian painters, including some of the most important artists of the time: Henry Campotosto, Louis Pierre Vervée, Alexander Joseph Daiwaille, Jean-Baptiste De Jonghe, David Emile Joseph De Noter, Alfred Verwee, and Barend Cornelius Koekkoek. Just as with the famous partnerships between Peter Paul Rubens and Jan Brueghel or Anthony van Dyck, Verboeckhoven’s colleagues each brought well-honed specialties to the team. 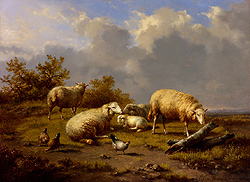 In the c.1850 Landscape with a Peasant and His Flock, for example, the shepherd was painted by Daiwaille while Verboeckhoven developed the image of the landscape and the animals. Like Rubens, the demand for his paintings far exceeded anything he could produce single-handedly. Perhaps his most famous painting, also created during the productive decade of the 1830s, was Hungry Wolves Attacking Travelers, now in the Rijksmuseum in Amsterdam. In this large canvas, all of Verboeckhoven’s highly refined skills are evident, from the anatomical precision of the horses, wolves and humans to the exacting depiction of the landscape. However, it is the emotional intensity of the horrific attack that makes this work so memorable; horses rear in confusion and fear as their riders struggle to fend off the ravaging pack of wolves. Not surprisingly, the painting was exhibited at the Brussels Salon in 1836 to considerable critical acclaim. 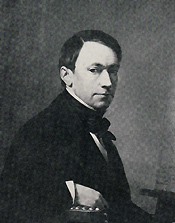 During the 1840s, Verboeckhoven again began traveling throughout Europe, this time focusing his attention on France and Italy. His continuing study of both nature and classical art undoubtedly contributed to his continuing success; Verboeckhoven seems to have understood that an artist is always in the process of revising accepted ideas and exploring new ones. Upon his return to Brussels, he accepted yet another responsibility when he began to teach at the Royal Academy in 1845. During this time, he added portraiture to his repertoire, although his landscapes with animals and peasants remained central to his work. King Leopold of Belgium himself commissioned an equestrian portrait in 1852, thus combining Verboeckhoven’s talents for both animal painting and portraiture. As his reputation grew, Verboeckhoven’s clients were increasingly international. Collectors in the United States, England, Germany and Russia eagerly sought his work, eventually making him one of the most famous and successful artists of his day. He exhibited in salons throughout Europe and in many private galleries, particularly in London, Paris and St. Petersburg Russia. Similarly, he received medals and honors from numerous nations; the Legion of Honor in France, the Order of Leopold in his native Belgium; the Order of the Christ of Portugal; and the Iron Cross in Germany. Eugène Joseph Verboeckhoven died on 19 January 1881 in Brussels at the age of 83, one of the most well-respected and prolific artists of his day.